Property Size 418 sq. ft. This cute little cabin is located on a large lot with plenty of parking. It is located under the large, fir trees with a large grass area and a picnic table and a propane barbecue. 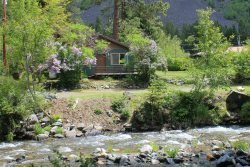 It is on 2+ acres in the heart of the recreational area at the head of Wallowa Lake. It has a backdrop of beautiful Mt. Joseph. Enjoy the privacy on the large deck while viewing the surrounding grass and trees. It is next to the Mini Golf, Park At The River RV Park and a short walk away from most of the Wallowa Lake activities. This pet friendly cabin is the perfect getaway for the whole family. It is next to Cabin #24 (Edelweiss). Rent both 23 & 24 allowing you to sleep 10 people!